Hamas is destroying Gaza: The Palestinian militant organization is sacrificing Palestinians. 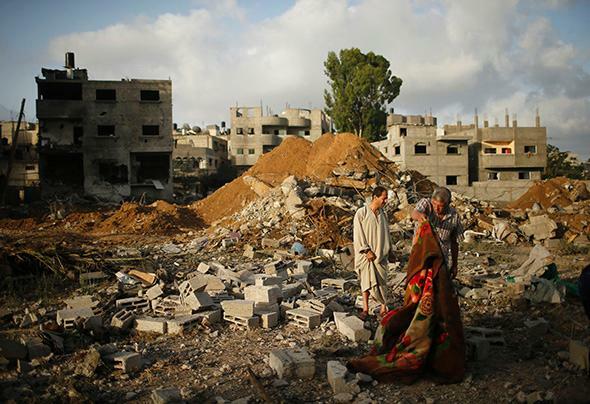 Palestinians stand among the rubble of a home that police said was destroyed in an Israeli air strike in Gaza City on July 13, 2014. There are lots of things we can debate about the crisis in Gaza. You can argue that Israel has committed war crimes, that a culture of violence has corrupted Palestinian society, or that a ground invasion is a terrible idea. But one thing should be clear to everyone: Hamas is insane. It’s destroying Gaza. I’m not saying this to excuse Israel. Its pathological relationship with Gaza—war, occupation, radicalization, bombardment, blockade—is full of callousness and mistakes. The casualty list from the current air campaign, filled with Palestinian civilians, is grotesque. Israel thinks its need to respond outweighs the cost of killing women and children. But part of the travesty is how little Hamas has done for its own people. Until a month ago, Israel was reeling politically. It had chosen as its putative enemy Palestinian President Mahmoud Abbas, a guy in a suit whose principal threat was that he might make Israel answer to international law. Benjamin Netanyahu, Israel’s prime minister, defied Israel’s best friend, the United States, by continuing Israel’s illegal settlement policy while nominally negotiating peace with Abbas. In April, when Hamas agreed to reconcile with Abbas and yield to him administrative authority over Gaza, Israel bizarrely quit the U.S.-sponsored peace talks, insisting that the merger meant Abbas would accept Hamas’ policies instead of the other way around. The kidnapping of three Israeli teens in June bought Israel some global goodwill, but Netanyahu squandered that with a massive crackdown in the West Bank. Then a few Jews murdered a Palestinian teenager, and rage boiled over. That’s when a new round of rockets started flying into Israel from Gaza. Israel fired back, the exchanges escalated, and the war was on. Critics accused Israel of violating the laws of war in practice. But Hamas flouted those laws explicitly. It fired rockets on every city within reach, declaring, “All Israelis have now become legitimate targets.” Weapons launched by Hamas and its allies have hit citizens in Gaza. They’ve hit Palestinian homes and buildings in the West Bank. They’ve hit Gaza’s power lines twice, knocking out 20 percent of the strip’s electricity. All this while managing, with more than 1,200 rockets, to kill only one Israeli. That’s what Hamas is doing. It’s trading Palestinian blood for political ambitions it foolishly expects to achieve through war. No amount of suffering in Gaza has persuaded it to stop. During the war’s first week, there was vague talk of a cease-fire, with each side reportedly holding out for further demands. Netanyahu declared that “no international pressure will prevent us from operating with full force.” Israel looked like a belligerent bully. On Monday, when Egypt announced a cease-fire proposal based on ideas sketched by Abbas, all Hamas had to do was say yes. The proposal entailed no concessions. It was just a break in the bloodshed, followed by talks. The Arab League embraced the plan. Abbas issued a statement that “urged all parties to comply with this truce in order to stop the shedding of Palestinian blood.” Israel accepted it and announced that, as of 9 a.m., it had stopped shooting. For six hours, Israel held its fire. But Hamas kept shooting. Rockets continued to fly from Gaza into Israel—nearly 50 in the next six hours—and Hamas took credit for them. Its spokesmen insisted that Israel had to open the borders and release Palestinian prisoners and that somebody had to meet Gaza’s government payroll. Any of these demands could have been discussed. What was crazy was Hamas’ eagerness to use, as its leverage, the perpetuation of a war that had already killed 200 Gazans. Your government claimed yesterday that it ceased fire, but without agreeing to carry out our conditions, and it thinks that we will hasten to cease fire. To the contrary, we hurried to strike every place in Israel, from Dimona to Haifa, and we forced you to hide in shelters like mice. We again caution: If your government doesn’t agree to all our conditions, all of Israel will remain a legal target for our fire. It’s pretty hard, after reading these statements, to cling to any illusion that Hamas cares about peace or the blood of Palestinians, much less the blood of anyone else. Hamas didn’t just reject the cease-fire. Its spokesmen mocked Israel for agreeing to the plan, calling this acquiescence “indicative of Israel’s weakness.” They “condemned international and regional support for the ceasefire initiative.” They derided Egypt, scoffing that “the Egyptian initiative is an attempt to defeat us” and that “those who ignore the Palestinian resistance should not be dealt with.” Egypt’s current regime has certainly been hostile to Hamas. But when you’re trapped by Israeli blockades, finding new ways to insult the only other country that borders your territory is deranged, particularly when it’s offering to stop the destruction of your people. Thanks to Hamas’ obstinacy, the war went on. After six hours of holding fire and being shot at, Israel resumed its assault. On Wednesday, at the request of the U.N., Hamas finally agreed to join Israel in a five-hour humanitarian pause. But how many more Gazans will die after those five hours elapse? On Tuesday, shortly after Israel gave up its unreciprocated cease-fire, Reuters published a Hamas commander’s summary of the conflict: “Thousands of people paid with their lives so that we and our people can see this day—the day Israeli leaders stood before their nation to say: ‘Sorry, Tel Aviv was hit.’ ” The people of Palestine and the world will have to decide whether that was worth so much blood.